Singapore’s first Prime Minister, Lee Kuan Yew, died in the early hours of Monday morning at the age of 91. As an outsider it’s been interesting to watch how Singapore mourns, and I can’t help but compare it to Australia. However, it’s a completely unbalanced comparison as Australia has no ‘founding father’. We don’t have one individual that we can point at and say ‘we are what we are today because of him or her’. One of our former Prime Ministers, Malcolm Fraser, passed away last week. There were articles and stories about his achievements and a state funeral will be held this coming Friday, but it’s an entirely different level to what I’m seeing here. Actually the only comparable Australian event I can think of is that of Phillip Hughes, a young cricketer who was tragically struck on the head during a match last year. Much of the response to Phillip’s death was, I believe, to do with his youth and the unexpectedness of his death. Lee Kuan Yew was neither young nor was his death sudden, so those elements are missing here. I spent time this morning talking to Singaporeans who are queueing to pay their respects at the Parliament, where Mr Lee is lying in state. 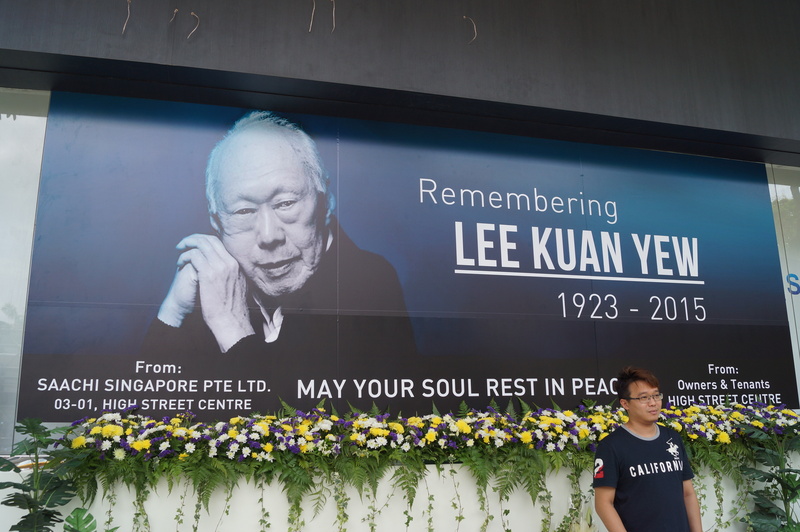 They all spoke of how much they respect Mr Lee for what he did for Singapore and how he built the tiny island into the business centre it is today. On Monday morning none of the commercial radio stations were playing their regular music, rather they were all playing sad, classical pieces. A week of national mourning was declared and flags were lowered to half mast. The Esplanade Theatre cancelled all non-ticketed events. Communities have a central place where people can go to pay their respects to Mr Lee and condolence books can be signed outside the Istana. The queue must be at least a kilometre long. People began arriving during the night, well before Mr Lee’s body was driven from the Istana to Parliament. The line was filled with all manner of people. Some had flowers. some had notes. 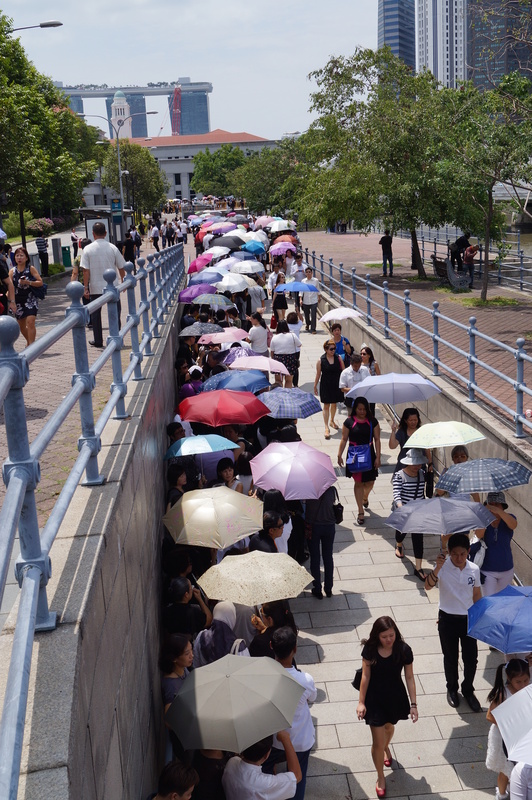 It’s very, very hot out there today and most of the queue is not shaded but everyone seemed happy to wait. Eager to pay their respects to the ‘founding father of modern Singapore’. The weather has been amazing the last month. This time of the year is what passes for winter in the tropics – the humidity has been lower, there’s less rain and there has even been a breeze! It’s been lovely to open the windows and doors and have the breeze blow through, although there’s a landfill fire in Malaysia at the moment, so if the wind is blowing the wrong way I have to shut the house to avoid it smelling like a bushfire. Swings and roundabouts. I always feel as though I blog into a void. 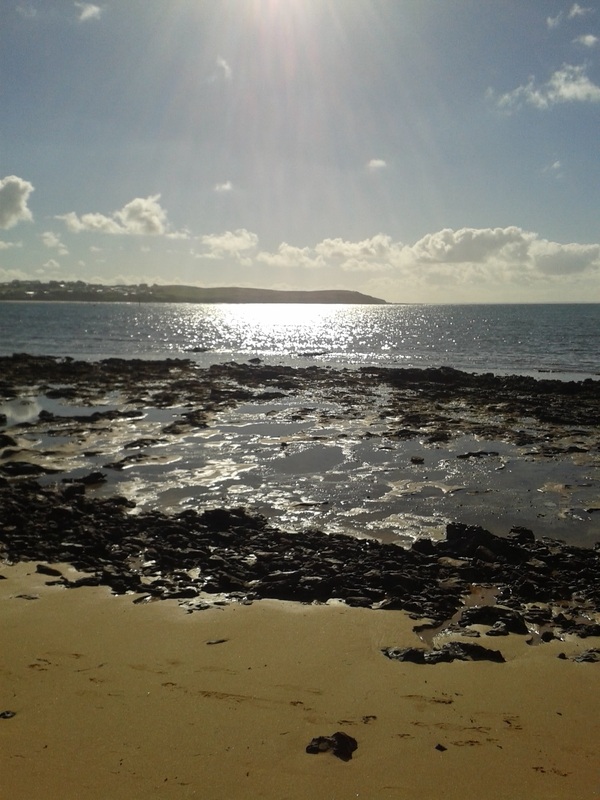 I blog as though no-one is watching, so to speak. I rarely look at my stats or promote this blog. It’s just not my thing. But it seems people other than my family and friends do read this blog as I’ve been given the opportunity to write the Singapore book of a long established series aimed at people relocating here. I’m apparently a little superstitious so I won’t say more at the moment but hopefully you’ll find my name on a book in March, 2016. After a lovely five weeks back ‘home’ I returned ‘home’ to Singapore and had the very good fortune to spend my first week digging in the dirt for remnants of the Second World War. Now, this may well not be everyone’s cup of tea but I’m currently doing two history degrees at university (one at Post Graduate level and another bachelor degree just for fun), so the opportunity to touch and feel history was too good to pass up. A couple of months ago I went on a walking tour organised by ANZA (Australia and New Zealand Association) of Hellfire Corner, which was one of the key battles leading up the Fall of Singapore. The tour was conducted by Jon Cooper, a battlefield archaeologist who had been working on The Adam Park Project, to uncover more detail about the fighting that occurred in the Adam Park area. The tour was very interesting and I was a bit miffed that I’d missed my chance to join in the archaeological digs the project had already carried out, but, serendipitously, a new opportunity came up to explore the battles that waged in the Mount Pleasant Road area and so I spent most of the past week digging in the dirt for bullets. The aim of the dig was to uncover (and recover) evidence of the battle that was fought along Mount Pleasant Road on February 15, 1942. Sources from the time show that the British fought a battle from the southern side of Mount Pleasant Road toward the house on the opposite side of the road, which had been occupied by the Japanese. 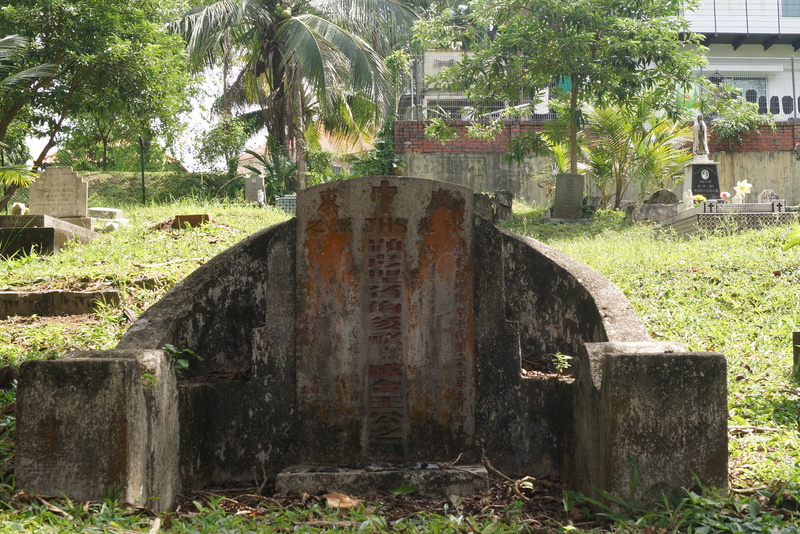 They also show that Captain Watson died during the battle and was buried at 159 Mount Pleasant Road, and although he was reburied at Kranji War Cemetery in 1946, there was hope of uncovering his initial burial site. The project centred on two distinct areas. The first was a 2 metre by 2 metre area where ammunition littered the surface (an old tree had been removed and monsoon rains washed away the topsoil which exposed them). The second was a broad sweep of the yard using a metal detector, which registered lots of metal objects below the surface. A dig is quite labour intensive. After the initial use of metal detectors it’s elbow grease and trowels to uncover the hidden objects. Once an item was uncovered (and we managed to get well over a thousand items of the ground!) it is put in a plastic bag, tagged with detailed information (date, location, description), which is then also copied on to a central register. So, first we dig and then we record. The recording of the information is just as important as the uncovering as this will allow Jon to recreate a diagram of where everything was located. Analysis of the diagram will, hopefully, show a pattern that might shed new light on the Mount Pleasant Road battle. A week ago I had never touched a bullet. Now I know that a round has two halves. The pointy bit is the projectile or bullet. The bottom half is the cartridge. 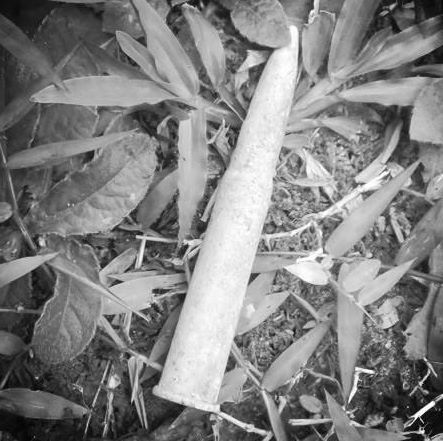 The propellent used in British bullets was cordite, whilst the Japanese used gunpowder. 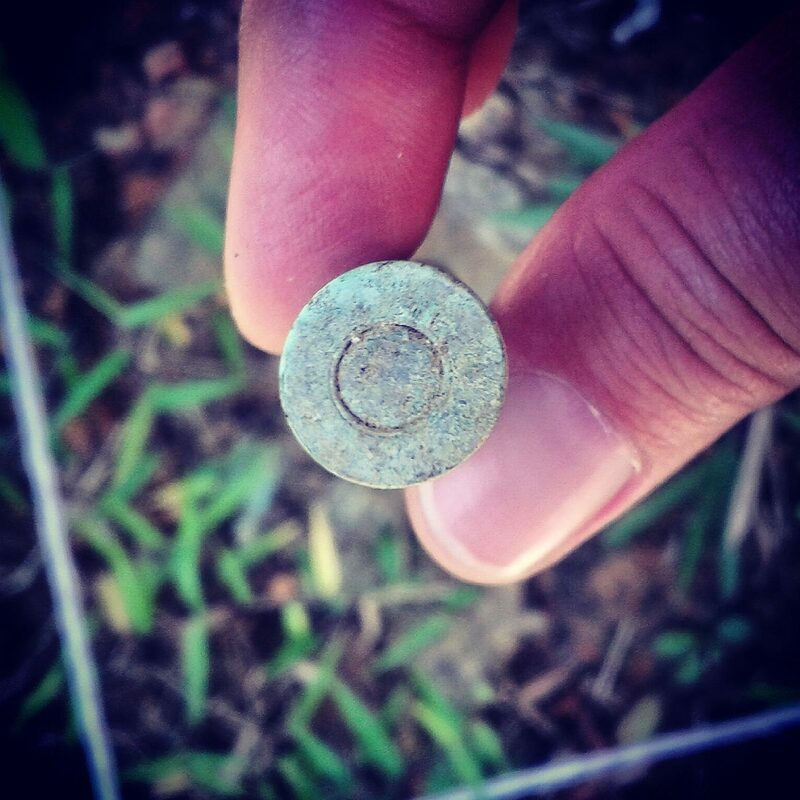 Japanese rounds are about a millimetre thinner than British bullets. The small circle on the bottom of the cartridge is called the ‘percussion cap’. The bottom of a British cartridge has lots of information stamped on it (which is why they are called ‘endstamps’! ), while Japanese ones have a pattern. It wasn’t ALL bullets, though. The team also recovered coins, buttons, tubes, and some other bits and pieces. If you’re interested in keeping up to date with Jon Cooper’s work, or volunteering on a project, you can follow his Facebook page, The Adam Park Project. There’s lots of photos and video of the past week. I am the badly dressed woman in the white shirt and blue hat. PS: Any factual mistakes are mine. I have so much new information swirling around in my head that it’s inevitable some it got scrambled. Yesterday on my morning surf around various news sites I came across an article that reported on research that proves that Australian expats typically move back to Australia in December or January. Well, DER! It’s a truth universally acknowledged that grocery shopping in Singapore is ridiculously expensive. This morning I was after palm sugar (aka gula melakka) and as I rarely see it in any of the supermarkets here I headed to Tekka Market. Unbeknown to me a lot of the stalls at Tekka are closed on a Monday but there are still a few open and this worked in my favour as it was less overwhelming! 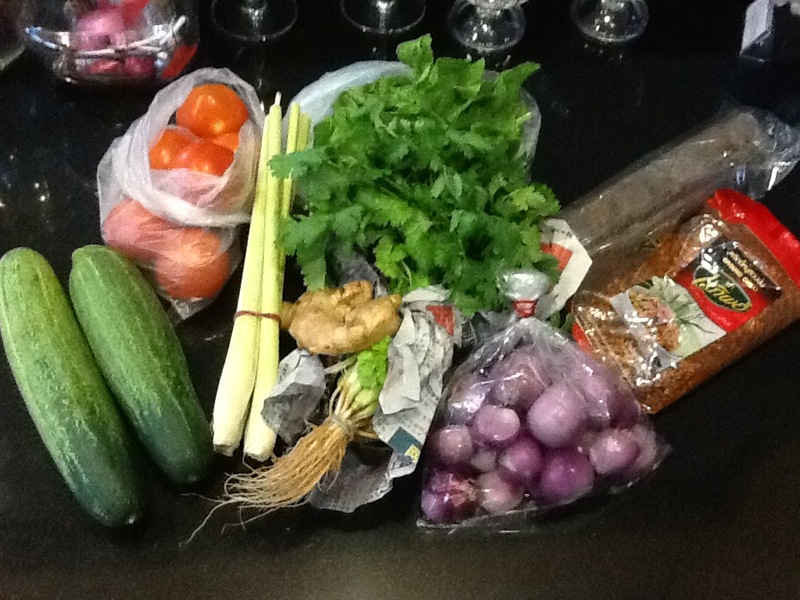 I also picked up few items of fresh produce that we needed and was dumbfounded at the price. Everything in the photo below cost $11. I decided to do a price comparison with the two big Singapore supermarkets chains using their online shopping sites and was stunned at the price differences. I normally shop at Fairprice Finest so I saved about $7 by heading to the wet market this morning but if you’re a Cold Storage shopper you’ll pay more than double than you will at the market. Cold Storage also don’t stock palm sugar in their online store. The wet market can be intimidating (and smelly) but the savings seem to be worth it! You never quite know what you’re going to encounter when you hop in a taxi in any country. Whether the driver is chatty or silent or young or old is the luck of the draw. Some easily understand my accent and some have required me to write down or spell my address, and while some find this annoying I’m the first to admit that the Australian accent and our mangling of vowel sounds takes a little getting used to! Anyway, the Other Half (OH) and were heading out on what seems to have become universally known as “Date Night” but what we still call “going out for dinner”, and as soon as we told the taxi driver where we were going he exclaimed “Oh, red light district!” and spent the entire trip regaling us with all the red light districts he had ever visited. He admitted he was a “naughty boy” but professed to be a reformed character now that he was older. We heard about Japan, Indonesia, Australia, Philippines but the most surprising was Hamilton, New Zealand. Of all the cities in the world I would never have guessed that Hamilton, NZ, would feature so highly as a city of ill repute. Mr Taxi Driver booked in to a local establishment for a massage and had the choice of standard, fantasy and VIP. He opted for both the fantasy and the VIP service and whilst we didn’t hear details of the VIP option we did learn that the fantasy massage involved two masseurs who entered the room with pink balloons attached to their breasts. Not really my idea of a fantasy but each to their own….. It wasn’t all a sordid conversation. Mr Taxi Driver shared that he used to be in sales but had recently retired but had grown bored so took up a taxi lease to keep himself busy. He didn’t work all day, every day like most taxi drivers but only worked during peak hours so that he benefited from the 25% peak hour surcharge. As soon as peak hours are over he heads home. When we reached our destination (Keong Saik Road) Mr Taxi Driver shared that it was a shame that the street full of hipster clubs and restaurants was no longer a red light district…..
There’s a Facebook group for expat women living in Singapore that I follow that frequently has “what should I bring from my home country?” type questions. Within seconds multiple responses will pop up from the opening poster’s fellow countrymen on all the goodies that should fill their container. The responses vary according to nationality but most things are convenience foods and pharmaceuticals. I occasionally join in if it’s an Australian asking, but at the end of the day you can survive here without these luxuries and, to be frank, you’ll probably adjust faster if you don’t bring everything from home with you. Sure, the first bit will be rough but it’ll get you out and about through necessity. That. I miss that. I miss the casual, meaningless interactions with people I meet in my day-to-day life. For the first year or so here when I was suffering from quite bad culture shock I followed the lead of the people around me and didn’t chat. As time has gone on, though, I’ve decided to exert a bit of my own culture into my new culture and I now instigate the chat. If I’m out walking I nod or smile or say ‘hi’ to every single person I pass. They are often very busy avoiding eye contact with me but i feel better for having tried. At my local supermarket I now start the chat with the cashier and slowly, but surely, Mary is starting to get used to my overly-friendly Australian way! It appear I have a “thing” for cemeteries. 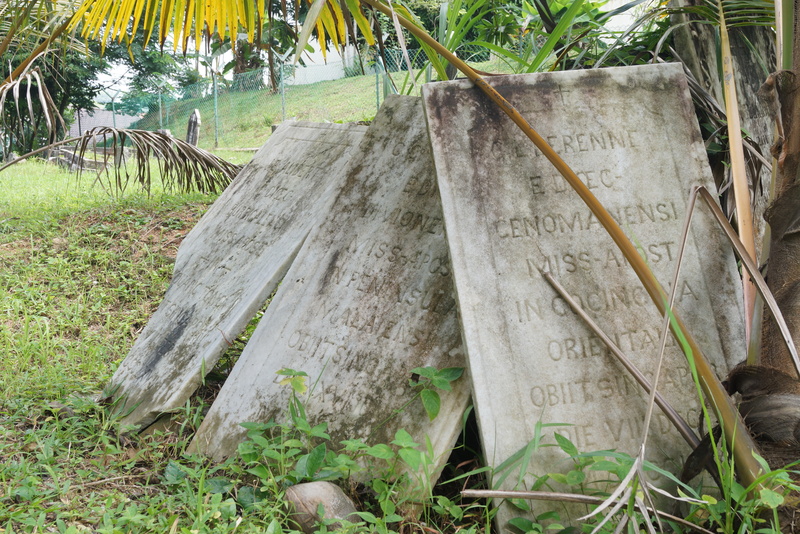 I’ve blogged about the Old Christian cemetery at Fort Canning, The Japanese Cemetery Park, Bididari Memorial Garden and now the oldest Christian church remaining in Singapore at St Joseph’s Catholic Church on Upper Bukit Timah Rd. I’m also studying a cemtery subject at university this semester. And am planning a research project on cemeteries. 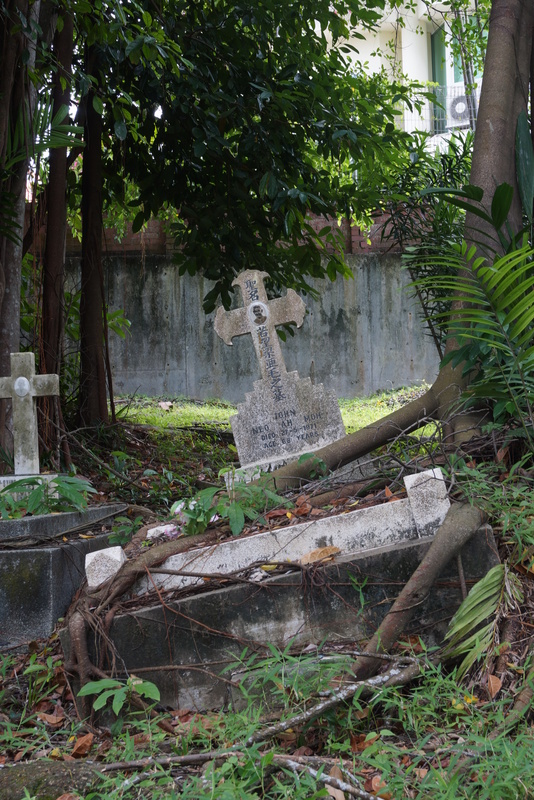 St Joseph’s Cemetery is behind St Joseph’s Catholic Church on Upper Bukit Timah and is the oldest remaining Christian cemetery in Singapore. As it is on church land it hasn’t been redeveloped (yet). 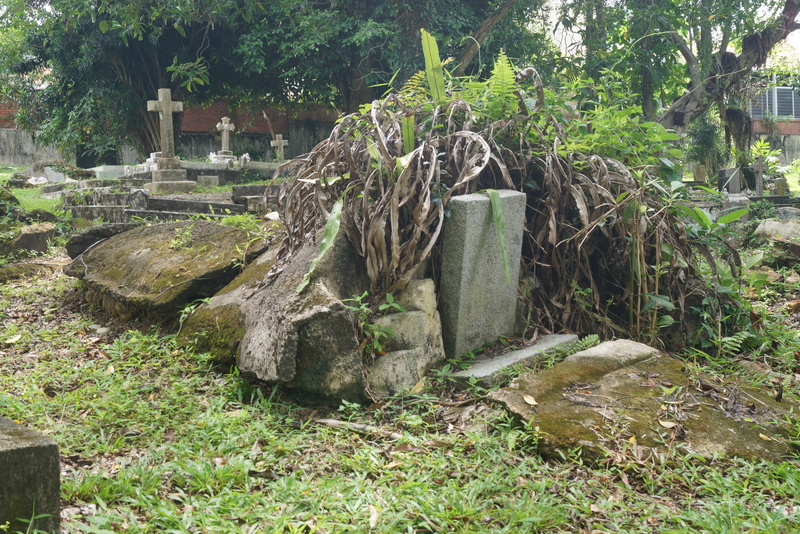 The cemetery opened in the 1850s and didn’t close until 1984, which is later than every other cemetery which all closed when most burials shifted to the Choa Chu Kang Cemetery complex in the 1970s. After the closure of St Joseph’s to burials some of the graves were exhumed but there’s still lot of old graves here and whilst I couldn’t read the epitaphs as most were in Chinese I found the variety of grave markers interesting. I had expected to see mainly Western style graves, but lots were traditional Chinese tombs where the headstone faces outward from the grave. By the 1850s, the Church has grown in numbers sufficient to irritate the secret society chiefs who launched a series of attacks on the Christians in the interior, spilling the soil of Singapore with the blood of its first martyrs. Worst still, tigers roamed freely in the interior possibly devouring a coolie a day in the 1850s. When the authorities did not let the body of a poor coolie carried of by a tiger be buried, wanting to use the human corpse as bait to lure the tiger back so that it could be shot. Fr Augustine Perie protested, retrieved the coolie’s body and prepared it for a decent burial, demonstrating that a poor person should never be treated without dignity, in life and also in death. 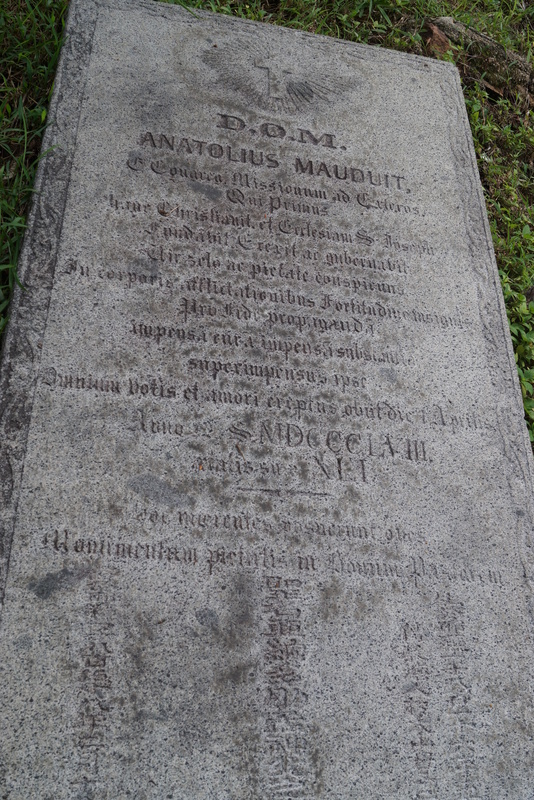 Fr Mauduit’s tomb was originally inside the church but his gravestone now lies in the grass of the cemetery. Rev Fr Anatolius Mauduit was the founding priest of St Joesph’s. These three grave markers belong to St Joseph’s early priests. Ahhhh…the bed is all mine!